This version does not run on on MacOS X 10.7 (Lion) or newer. There are no plans to update this to work on newer versions. For legal reasons, the source code can not be released. Please do not contact me asking about a new version. Please look elsewhere for future development. 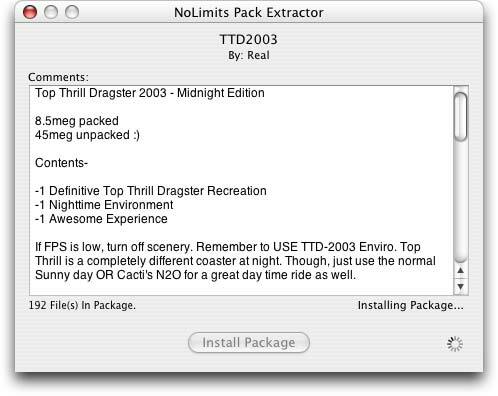 The NoLimits Pack Extractor enables Mac users to extract the track files and extra media objects in "SFX Track Packs", which are self extracting track packs in Windows executable format, and the newer ".nlpack" files. It works on MacOS X 10.2 and newer. Does It Work With All Track Packs? No. Only SFX Track Packs with a version number of 1.3.0 or higher can be opened with this version of the Pack Extractor. Most tracks packaged after January of 2004 will be in the newer format. 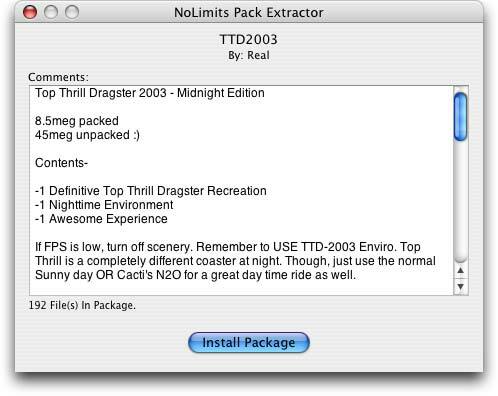 Some sites (such as CoasterSims.com) have asked track authors to repackage older tracks specifically so that you can open them with this program. Please show your appreciation to those sites. Can I Create Track Packs With It? Not at the moment. Future versions may include this feature. Step 1. Click the Install Button. Step 2. Wait a second or two for the installation to complete. Step 3. Click the "Ride!" button to open the track with the simulator. No, I Said: "How Does It _Work_", Like With The Old SFX Files? It just looks past the windows executable code and extracts the file data with zlib, which is included by default with MacOS X. Really.. Nothing too exciting. I Just Want To Double-Click Pack Files To Open Them. Can I Do That? Right/Control-Click on the file icon and choose "Get Info" from the contextual pop-up menu. Navigate to the "Open With" section. 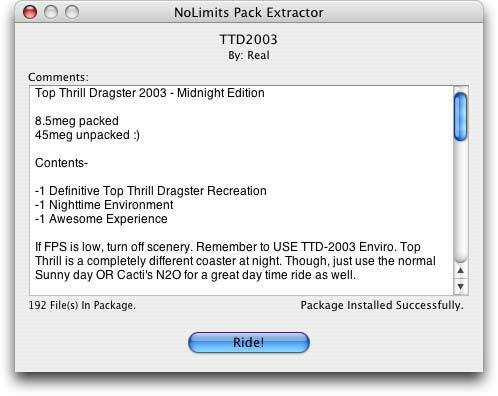 If the NoLimits Pack Extractor is not in the pop up menu, choose "Other" and select it. Press the "Change All" button. Note that you should only enable double-click opening of track packs if you don't have any other reason to be opening windows executable files on your Mac (such situations do exist, though they are rare). Can I Install Track Packs To Other Folders? Yes. Simply set the folder you wish to install to in the preferences. You will be asked if you really want to do that, to make sure you know what you're doing. Note that the "Ride!" button is disabled if you install to a folder that does not contain the simulator application. My "Ride!" Button Is Broken! What's Up With That?! Either you didn't install to the NoLimits application folder (see above), or your NoLimits simulator application has been renamed. The correct name is "NoLimitsSimulator" (no spaces). When I Choose My NoLimits Application Folder, I'm Told That It Isn't, But I Know It Is. Why? First, be sure that you are selecting the folder that contains your NoLimits applications, and not another folder inside of it. Your NoLimits simulator application might have been renamed as well. The correct name is "NoLimitsSimulator" (no spaces). Phil Hilton wrote it, with the consulting assistance of Jennifer "Tia" Lynn (the person who wrote the windows version and laid out the SFX file spec.). I Found A Bug Or Have A Comment. Where Should I Send It? Use this form to send a message to Phil. Sorry - This is just an anti-spam measure. Copyright © 2004 Phil Hilton - InterFix Communications, Ltd.